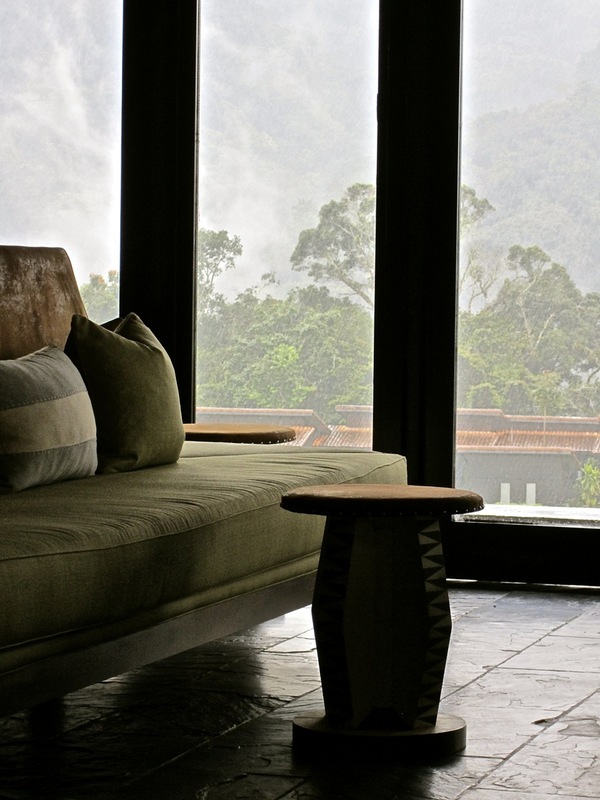 Our oldest daughter has been visiting us — which is very nice — so this weekend, we took her to see the Nyungwe Forest in the south of Rwanda and to stay at the beautiful Nyungwe Forest Lodge. 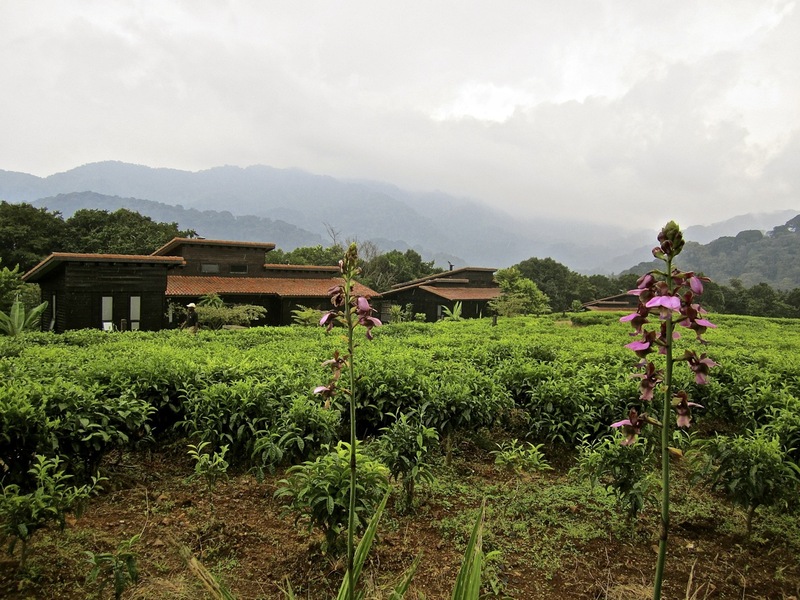 Orchids and tea bushes in front of the cabins at Nyungwe Forest Lodge. 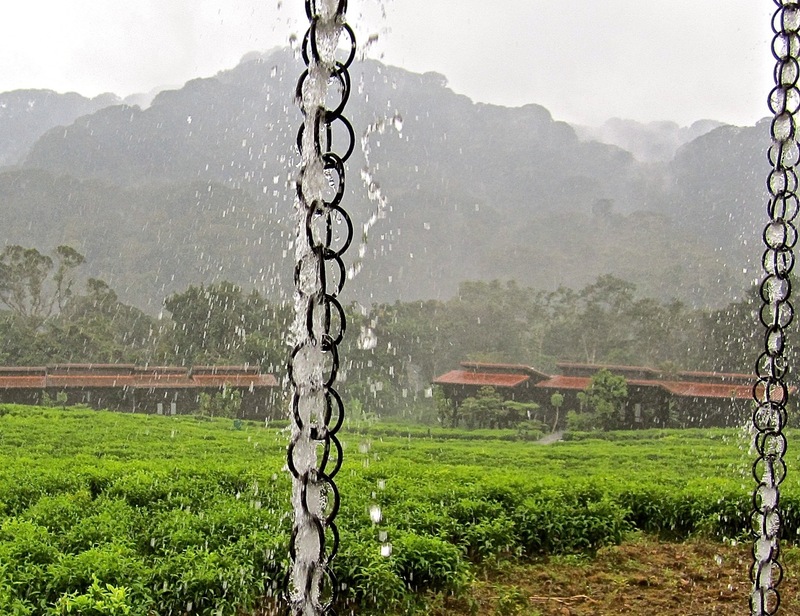 The Lodge is located on the western edge of the Nyungwe National Park in a tea plantation picked by a local cooperative. 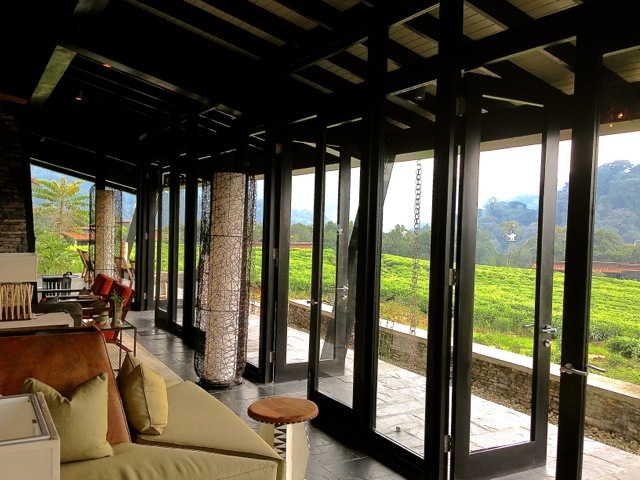 The cabins front to the tea fields and their back windows look out on the forest. 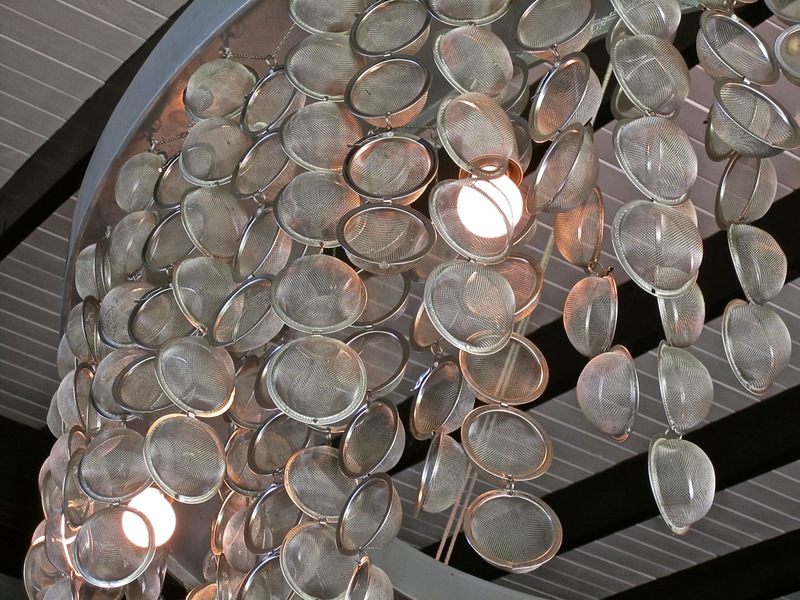 Rainchains in action on the main dining and lounge building at the Lodge. The area is currently having clear blue mornings and rainy afternoons. On Saturday, our one full day there, we hiked the canopy walk before lunch (more on that later this week). Then we actually talked about going on another hike that afternoon. However, with the first raindrops, we gave in to the luxury of just parking ourselves in front of the many picture windows looking out on the gorgeous view and napping and reading until the 5:00 p.m. tea, cookies, and cocktails in front of a fire. 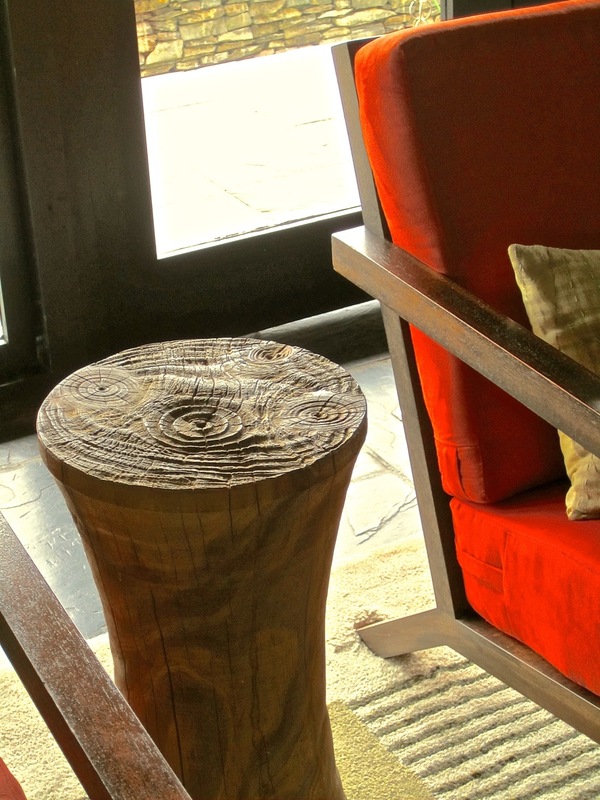 The lounge at the Lodge. Photo by Mary Koran. Just before tea time, we were rewarded for our indolence by finding about a dozen blue monkeys in the trees right outside our cabin’s back patios. 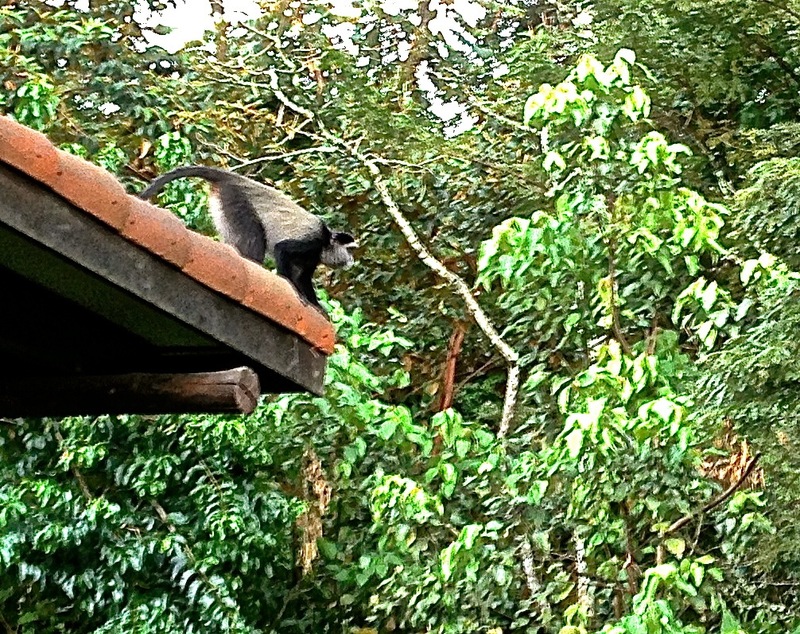 A blue monkey (Cercopithecus mitts) about to jump from cabin roof to the trees. Photo by Mary Koran. 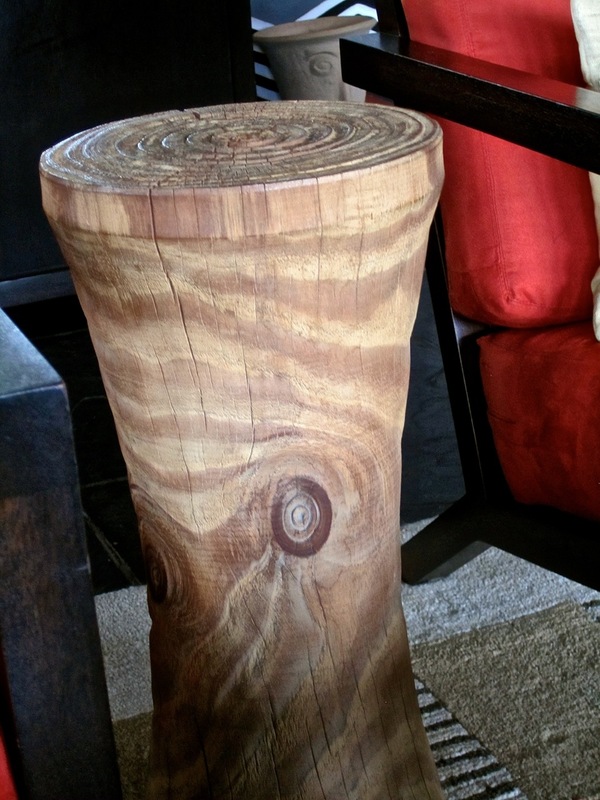 I wanted to show you these side tables in the main lounge, which I loved. Unfortunately, I forgot to ask if they were locally made or imported — next time. 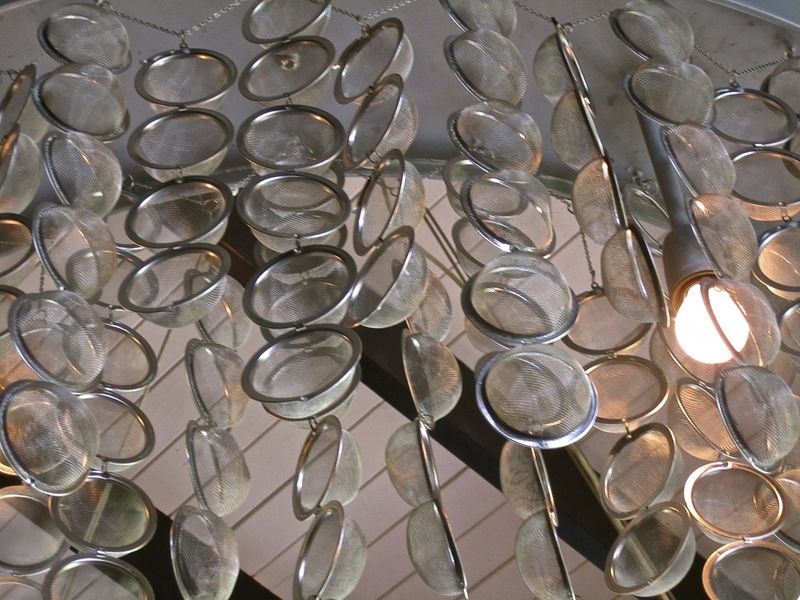 The big chandelier was appropriately made of tea strainers. 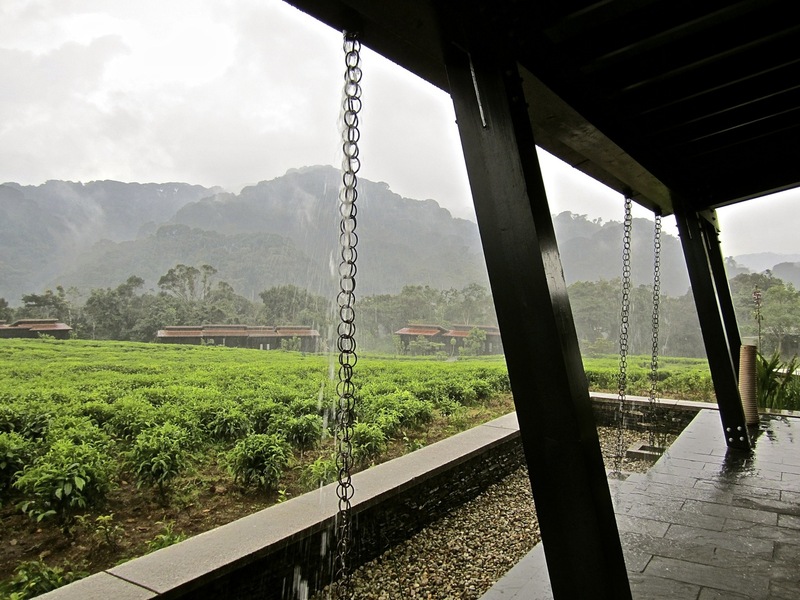 Camellia sinensis leaves have little or no smell (only if you crush them hard) until they are processed as tea. But the hotel smelled very lightly of green tea fragrance from the soap and hand lotion in the bathrooms and gift shop. So, sitting on the terrace or in the main lounge looking out, I could smell what I thought the fields should smell like (but really don’t). I thought this was an interesting little manipulation of experience in a landscape. My daughter brought me a Kindle Fire e-reader, another really nice thing, which allowed me to spend the afternoon switching from Vogue, to the third book of the Game of Thrones series, to Hilary Mantel’s Bring Up the Bodies. 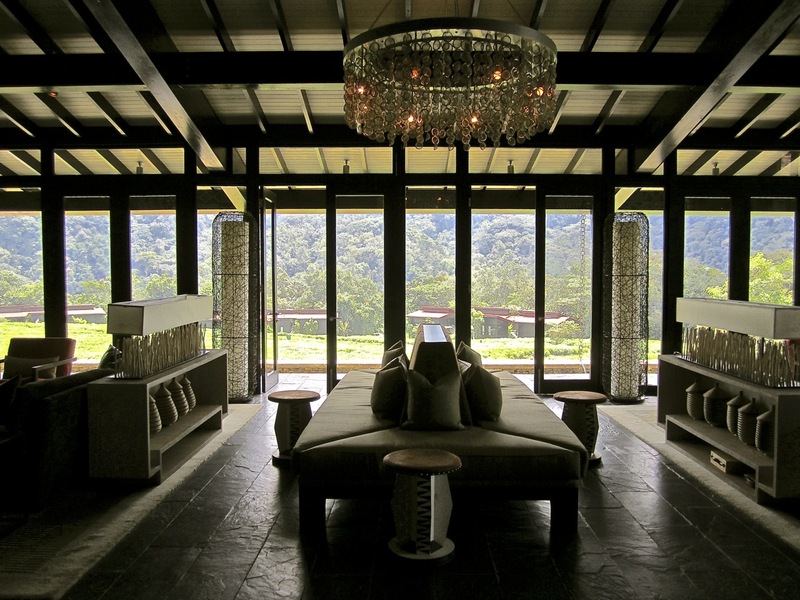 I’ve written about Nyungwe Forest Lodge previously here. Ah….that’s why I haven’t heard from Mary! :) Enjoy! tea strainers? Appropriate, yes – but oh how wonderful they look sparkling on a grey soggy afternoon. And thank you for the poem, it fits perfectly in every way! 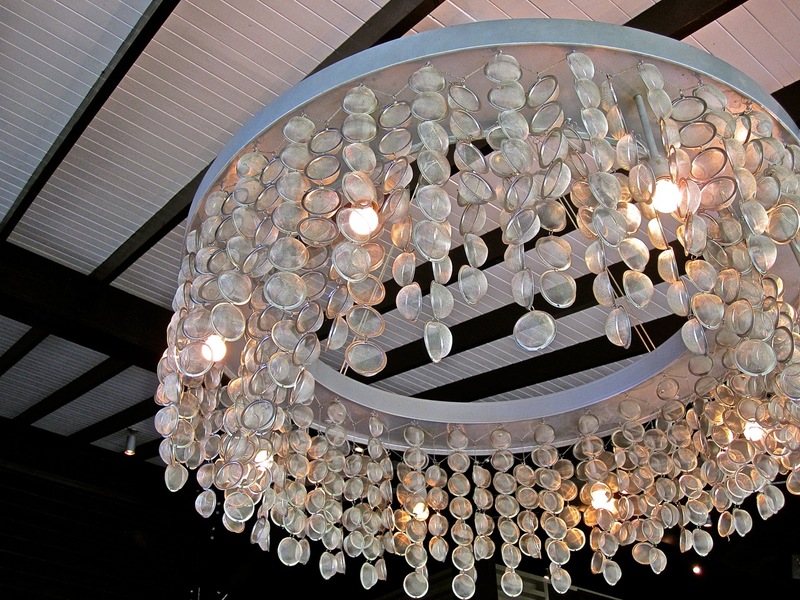 I, too, love the chandelier made of tea balls. What a clever idea.